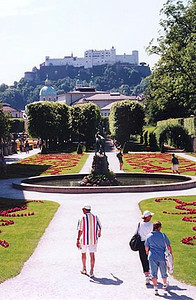 This is a view of the Mirabellgarten with the Festung Hohensalzburg (castle) on the hilltop in the background. If I had my choice of cities to live in, this would be it. My mom had the pleasure of living here and studying music at the Mozarteum back in the late 40s and 50s. Things weren't quite so rosy back then though. Is this home? Yes, its also heaven.